Nestle is a brand well known for both its chocolate and its cereal, so it is only natural that at some point they would combine the two together. 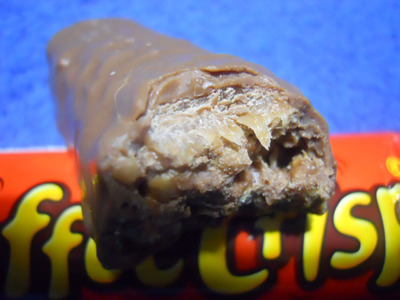 Toffee Crisp was first launched in the UK in 1963, and consists of puffed rice covered in milk chocolate. The idea came about when John Henderson saw his wife making chocolate cake and serving Rice Crispies. He took the two things to work with him and started to think of ways on how to combine the two. The answer was to link them together with toffee. The slogan of the bar is 'Crispy Crunch, Chewy Munch'. I for one don't think they are crispy at all, but chewy and delicious? Most definitely. They are soft in texture, and when you bite in, it feels like your mouth is filling up with milk. I think it is one of those bars overshadowed by some of its Nestle brothers, such as KitKat, but it deserves just as much attention.